Microsoft has been promising an LTE version of its Surface 3 tablet for months, and is just now starting to deliver. Starting Friday, Microsoft will sell the Surface 3 with 4G LTE to business customers through Deutsche Telecom in Germany and O2 in the United Kingdom, following a quiet launch in Japan a couple weeks ago. Spain’s Movistar and France’s Orange Business Services will follow shortly after. As for retail sales, the Surface 3 with 4G LTE is coming to the United States (on T-Mobile and Verizon Wireless), France, Germany, and the United Kingdom in the “coming weeks.” In the United States, these models will cost $100 more than their non-LTE counterparts, at $599 with 2 GB of RAM and 64 GB of storage, and $699 with 4 GB of RAM and 128 GB of storage. Microsoft says it’s targeting the enterprise first due to “particular excitement for our LTE-enabled Surface 3 with businesses and their sales forces.” For these customers, Microsoft is offering special configurations with 4 GB of RAM across the board and Windows 8.1 Professional (along with an option to upgrade to Windows 10 for free). This isn’t Microsoft’s first Surface tablet with 4G LTE. That distinction goes to last year’s Surface 2, which has since been discontinued as its Windows RT software heads for retirement. 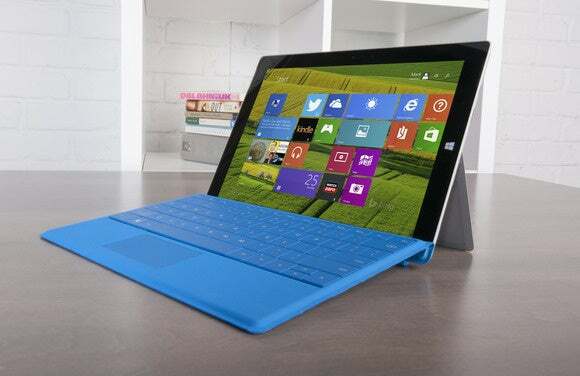 The Surface 3 runs full-blown Windows 8.1, making it much more attractive for business users. Microsoft hasn’t announced any plans to bring LTE to the more powerful Surface Pro 3, though a cheaper Core i7 model with Wi-Fi did pop up this week. Why this matters: Microsoft’s decision to go enterprise-first isn’t a huge surprise, as the ability to quickly get online from anywhere will matter most to business travelers who can expense the cost of a tablet data plan. Regular users are probably better off using their phones’ mobile hotspot capabilities, which are now included with most wireless data plans.